The Carrying Stones Project is an ongoing series of sculpture, data visualization, and social practice works that explores the inequities surrounding women’s paid and unpaid labor. Cooking, cleaning, childcare and eldercare responsibilities often still default to women, keeping them from advancing at work and in society. Even community volunteerism—care-taking of the larger community—falls disproportionately on women. This project documents the physical, emotional, and practical effects of these imbalanced burdens. The inequalities that working women face are both systemic and pervasive, and those biases affect individual women differently. As such, the concepts for the Carrying Stones works are distilled from the personal narratives of women of diverse ages, ethnicities, working roles, and socio-economic statuses. 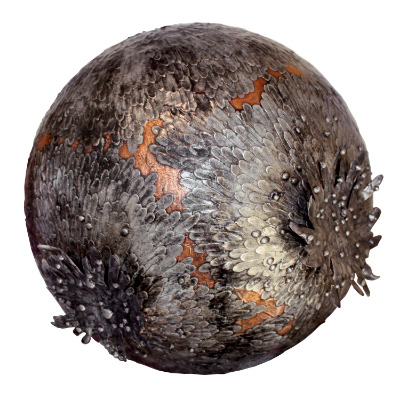 Both sculptural and painterly, the botanical forms in my work are clad in layers of silver solder and copper, as if their delicate bodies are growing the armor they need to flourish in our ever more hostile environment. Using the texture of the metal as my primary mark-making medium, the liquefied silver morphs into bark, or feathers, or scales. There is eloquence and beauty in the act of self-protection. The surfaces of my soldered metal pieces draw inspiration from unexpectedly diverse sources—typically a mash-up of California native flora and Medieval weaponry—though I’ve also tapped into the organic patterns of coral, fungus, and lava flows for fresh ideas. When building these works, I begin by covering the areas I want to solder with thick copper foil. Next, I lay down the first layer of texture in silver solder—like painting with molten metal. I add dimension to the work by placing beads of solder to create depth and contrast. The pieces are covered with a rich black patina, and burnished with steel wool to bring out shining highlights on the raised peaks, while leaving dark in the valleys.